NEW YORK, NY — September 25, 2017 —Trifacta, the global leader in data wrangling, today announced that Leidos (NYSE: LDOS), a FORTUNE 500® science and technology company, has chosen Trifacta as the data wrangling solution for the Leidos Collaborative Advanced Analytics & Data Sharing (CAADSTM). Leidos leverages Trifacta within CAADSTM to enable government agencies to wrangle biomedical data for more effective analysis within healthcare and life sciences. Leidos provides innovative solutions to meet the challenges that today’s federal agencies face. Leidos recognized that data wrangling was a critical aspect of the analytics process for its customers and selected Trifacta as the data wrangling solution within its CAADSTM platform. 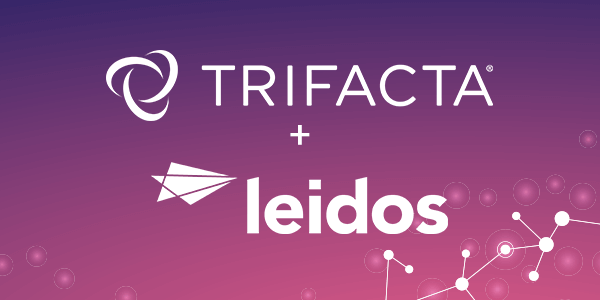 Trifacta and Leidos collaborate to provide data wrangling and analytics solutions to a growing number of government agencies, including the U.S. Mint, NASA and the Centers for Disease Control (CDC) among others. Trifacta and Leidos will be highlighting their collaborative solution at the Strata Data Conference in New York. The joint presentation with the CDC will showcase how the organization leverages Trifacta within CAADSTM to monitor the outbreak of HIV as it relates to the opioid epidemic occurring across the country. Dr. M. Ryan Weil, a chief scientist at Leidos, will outline the CDC’s approach to the data inference, characterization and visualization processes that are being pioneered by The Microbial Transmission Network Team (MTNT) and explain how the CDC has leveraged the CAADSTM platform including Trifacta to execute their analysis. Connor Carreras, a customer success manager at Trifacta, will demo how MTNT leverages Trifacta’s data wrangling solution to perform deeper exploration and more efficient transformation of complex epidemiologic data. Trifacta is the global leader in data wrangling. Trifacta leverages decades of innovative research in human-computer interaction, scalable data management and machine learning to make the process of preparing data faster and more intuitive. Around the globe, tens of thousands of users at more than 8,000 companies, including leading brands like Deutsche Boerse, Google, Kaiser Permanente, New York Life and PepsiCo, are unlocking the potential of their data with Trifacta’s market-leading data wrangling solutions. Learn more at trifacta.uptrending.com.